The UW-Green Bay Office of the Chancellor e-mailed the following memorandum from Chancellor Miller to faculty and staff on Wednesday, November 15, 2017. 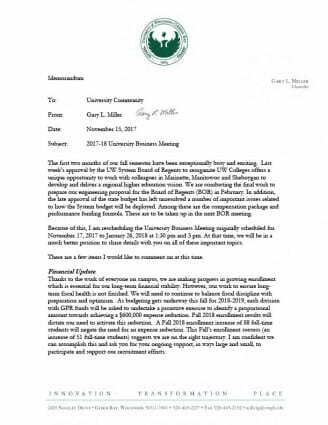 The memo explains reasoning behind rescheduling the University Business Meeting to January 26, 2018 at 1:30 p.m. and 3 p.m. in the University Theatre, Theatre Hall. 1:30 – 2:45 p.m. and 3:00 – 4:15 p.m.